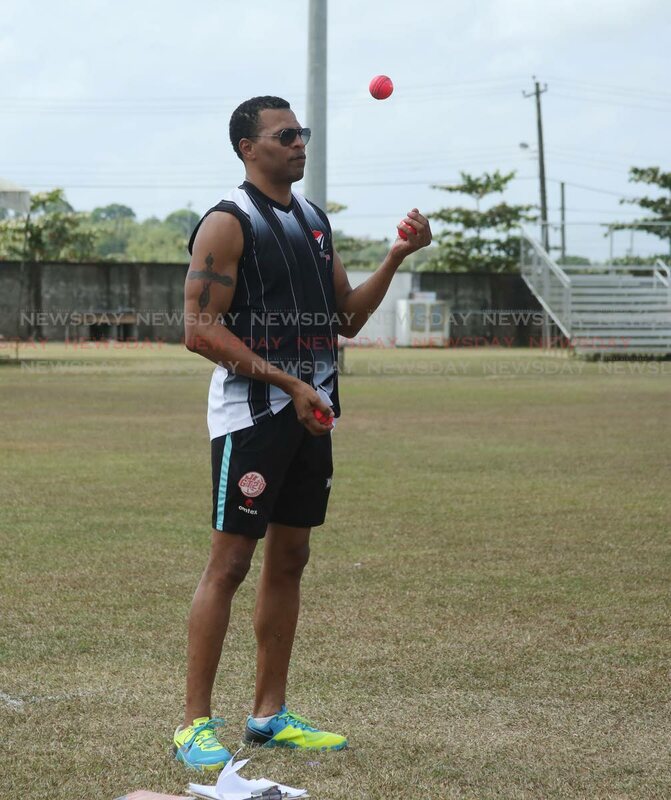 Red Force coach Mervyn Dillon at a training session at the National Cricket Centre, Couva recently. COACH Mervyn Dillon wants his team to approach the rest of the season game by game, as the Red Force aim for their second consecutive win in the West Indies Regional Four-Day Championships. The Red Force take on Barbados Pride at Kensington Oval in Bridgetown, Barbados, from 10 am today. Dillon's run as coach of the Red Force got off to a dream start with an emphatic 93-run win over leaders and defending champions Guyana Jaguars at the Queen's Park Oval on Saturday. Despite the win, the Red Force remained last in the six-team standings with 50.2 points from two wins and three losses. However, the Red Force can move up the standings after this round of matches is completed as only four points separate them from their opponents today. Dillon, who replaced Kelvin Williams as Red Force coach, said, "We are looking for victory in every game going forward. We are still last in the standings but the table is still wide open and all we can control is the games that we have left; once we do that hopefully things could go in our favour with the other matches. My focus is the games we have, and like I said, we have five finals left...My main focus is for us to play each game and try to maximise what we get from each game." The Red Force added experience for this match as opener Lendl Simmons is in the squad. Dillon believes Simmons, 34, is making a difference. He said, "For me personally, I think Lendl just being here he has already made an impact. That is one of the reasons I talk about having some of the senior guys (around). I always talk about the Lendl Simmons, the Dwayne Bravos, the Ravi Rampauls, the Denesh Ramdins, who all would have played a lot of cricket together. For me, I always remembered the way those guys played the cricket and I think it is something that youngsters could learn from." Fast bowler Rampaul also made a return to the Red Force line up against the Jaguars after a six-year hiatus in four-day cricket. The Red Force coach said Simmons is not in the team to make up numbers. "He is looking forward to scoring some runs as well because he has a lot of pride in his performance and we are looking forward to seeing him as well. It is really good to have him back. He has made himself available and the selectors feel he does bring something to the team and I am really happy with that," Dillon said. Dillon said the team will look at the pitch this morning and decide on the starting XI. Denesh Ramdin (captain), Joshua Da Silva, Jeremy Solozano, Lendl Simmons, Jason Mohammed, Yannic Cariah, Imran Khan, Odean Smith, Bryan Charles, Anderson Phillip, Khary Pierre, Daniel St Clair, Ravi Rampaul, Mervyn Dillon (coach), David Furlonge (assistant coach/manager), Jason Pilgrim (physio). Reply to "Dillon goes for second Red Force win"